The explosion and fire this week aboard the Deepwater Horizon rig in the Gulf of Mexico is a stark reminder of the dangers inherent in the offshore drilling industry. The BBC’s Daniel Nasaw examines the safety record. On 6 July, 1988, condensed gas aboard the Piper Alpha oil platform in the North Sea ignited and exploded, causing a conflagration that ultimately took 167 lives. 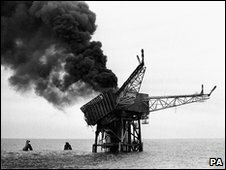 The accident, the worst in the history of the global offshore oil industry, led to a dramatic reworking of the health and safety regime on board rigs and platforms across the world. Industry officials acknowledge that hazards can be contained but the threat to workers and the natural environment never ceases. Deepwater Horizon, operated by Swiss drilling giant Transocean under contract to BP, sank on Thursday in roughly 5,000ft of water after burning for two days 52 miles (84km) south-east of the Louisiana port of Venice. The blast remains under investigation. Eleven workers remain missing and are feared dead, and the rig’s sinking remains a threat to the region’s environment. The incident occurred just three weeks after President Barack Obama defied his liberal supporters with a pledge to expand drilling in the Gulf of Mexico. The rig was carrying 700,000 gallons of fuel oil when it sank. 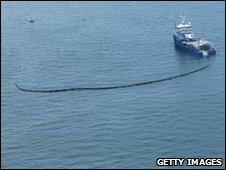 Since the disaster, thousands of gallons of gallons of oil have leaked into the sea. Ed Overton, a Louisiana State University environmental sciences professor, said he expected some of the light crude oil to evaporate while some might wash ashore in chunks. While statistics indicate safety on offshore oil facilities has improved in recent years, it remains one of the most hazardous industries, along with construction, logging, fishing and agriculture. Among offshore companies regulated by the British Health and Safety Executive, rates of serious injury and death have trended broadly downward since 1997. Since 2001, 858 fires and explosions have broken out on oil and gas industry facilities in the Gulf of Mexico, killing more than 55 workers, according to the US Minerals Management Service. Dangers include heavy equipment, flammable substances under intense pressure, frequent helicopter trips and the overall maritime environment. “Hydrocarbons are inevitably flammable, so the hazards are there,” says Robert Paterson, health and safety director of Oil and Gas UK, an industry group. British Petroleum is the largest driller in the US Gulf of Mexico and has significant operations elsewhere in the US. In 2009, the US Occupational Safety and Health Administration fined the company a record $87m in connection with safety hazards at a Texas City refinery that exploded, killing 15 workers.